I could see Calib beginning to go into hysterics. He began to pace and flap his arms as he continued to tell me it was, in fact, not time for lunch. First grade always went to lunch at 11:30am. Children with autism spectrum disorder, or ASD, often have the trait called rigidity. Rigidity, by definition, means, “emotional inflexibility and resistance to change” (Merriam-Webster 2016). Children who are rigid struggle with change. They need their lives to be predictable. This, in my personal experience with children, can stem directly from anxiety, as well as from the inability to make the mental shift required when plans have to change. There’s a disconnect between the event that the child thinks should happen and the event that is actually happening. Parents and teachers of children with ASD are familiar with the meltdowns or shutdowns that can occur when a schedule is interrupted. The children no longer feel safe, for the unknown is frightening. There is good news, though! Enhancing Generalized Teaching Strategy Use in Daily Routines by Parents of Children with Autism, an article by Shubha Kashinath, Juliann Woods, and Howard Goldstein at Florida State University, says that research gives us evidence that children with ASD seem to learn best through the organic daily routines with their families, rather than artificially scheduled interventions (Kashinath, Woods, and Goldstein). This means that your child with autism is more likely to learn important life skills through your daily routines and interactions at home. This is good because it means that practice with flexibility at home during the holiday season is more likely to help your child than a scheduled session somewhere else. Of course, this isn’t to downplay the importance of licensed therapists and other professionals. It just helps us understand that, as with most learning, the best foundations are laid at home. Holidays are a great place to start. Let’s put ourselves in the shoes of a child with an autism spectrum disorder. 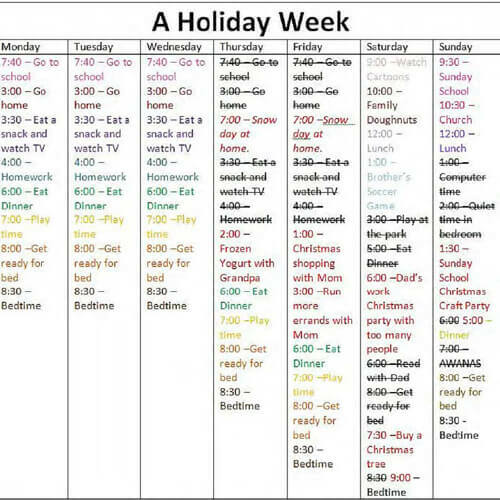 Your family has a general schedule they stick to. It’s consistent enough that you’ve been able to chart it in your head. While things will change here or there, for the most part, life is generally predictable. You might grumble when your brother’s soccer game is switched to interrupt your playtime, but you know you’ll still get playtime sometime that day. Events may be in a different order, but they’re still mostly there. As you can see, there’s a lot of red in this schedule. And all that red means change. The structure you crave so much has been broken. You’re suddenly thrust into a world of too many people and unfamiliar places, and you have no idea whether or not you’ll ever get quiet time again. Will your teacher be angry because you didn’t go to school, despite the snow? Will the Christmas party be loud, or have too many smells? Will your dad’s boss insist on pinching your cheeks, even though it hurts? The changes of the holiday season can heighten stress, which is the last thing we want to do when children with ASD often have lots of anxiety already. 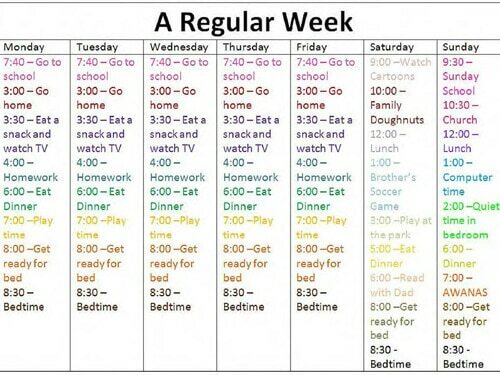 While it’s not possible (nor healthy) to shield our children from every schedule change they encounter, it is possible to make these changes easier and to give them a transition period they can not only tolerate, but also look forward to. In my experience with students with ASD, one of the best ways to avoid a meltdown or panic attack due to a schedule change is to warn them as clearly as possible about the upcoming event. The more we communicate with our children about coming changes, the better they can prepare. If discussed enough, the new event can become a part of the schedule on which they can count. The best way to do this is by building changes into your own family plans. In other words, come up with family traditions that you can carry out every year. 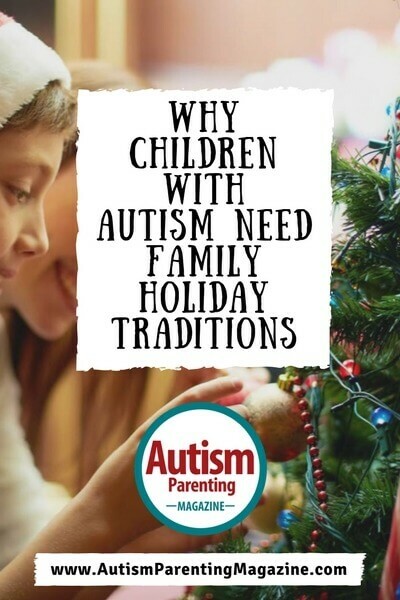 These traditions can provide fun for your family and practice flexibility for your child with ASD. Your child will probably resist the changes at first, but don’t let his/her initial rejection deter you from making these plans. Remember that rigidity is a characteristic of most children with autism. It may take several conversations before your child is more prepared to accept your adjustments. If you want to speed the process, however, consider involving your child in the new activities. Does he/she like trains? Look for a Christmas train your family can ride. Does he/she like Star Wars? Look for Star Wars tree ornaments to decorate with every year. Maybe while you’re decorating, you can put on soft Christmas music and eat cookies. The more you make these traditions a part of the yearly schedule, the more practice your child will have with flexibility! He/she can count on those events as safe and enjoyable. If you can find holiday traditions that you will be able to carry out every year, your child will not only adjust to the change, but will have something to look forward to. Fireworks: Consider bringing noise-cancelling headphones or starting small with just sparklers. Crowded Parties: Small gatherings can be great places for children to learn and practice social skills, but a company party may be too much. The smells, sounds, and lights can be beyond overwhelming for children with ASD. Perhaps a visit to Grandma might be a better option, and you can save the partying for the family get-together on Thanksgiving. Big Dinners: Large holiday meals give lots of food to enjoy, but children with taste and texture sensitivities can find the smells overwhelming…kind of like many pregnant women do (I sure did). Help your child by finding (or even bringing) foods that he/she can eat and enjoy and by creating a barrier against “helpful” family members who want the child to try everything. Themed Dress-Up Characters: Many children find the Easter Bunny in the mall to be scary (I do, too, to be honest). But children with ASD can find it terrifying on a whole new level. The costume probably smells, the child is being touched by this horrifying creature, and the camera flashes brightly while the photographer directs him/her to pose all different ways. These costumed characters can make cute pictures, but unless your child really wants to go visit Santa in the mall, I wouldn’t force it. Too Many Presents: We all love giving presents to our children, but too many all at once can be disorienting. It might be better to space your gifts out. Perhaps you always open one on Christmas Eve morning, then two more that night, then the remaining ones the next day. Or for a birthday, make a tradition of spreading gifts out for a “birthday week.” Also consider lessening the number of gifts they get, making sure the ones they get are gifts that they will really enjoy. The idea behind helping your children learn flexibility at home is to give them a safe place to learn. Moving forward at a pace you’re all comfortable with will be more beneficial than rushing things and making everyone miserable in the process. Don’t be afraid to start planning months in advance so the child has ample time to think about the changes coming. You know your child better than anyone else, so you will be his/her greatest asset in planning fun holiday activities that all of you find enjoyable, keeping in mind your child’s sensitivities while you do so. Buying a live Christmas tree as a family. Helping Dad cook the turkey or special dish every Thanksgiving. Buying sparklers at the fireworks stand. Reading the Easter story as a family from a particular book on Easter Sunday. Decorating the tree while enjoying a favorite drink or snack, in addition to listening to a certain radio station or a favorite Christmas movie. Watching the same movie on a certain date(s) each year. Baking Valentine’s Day cookies for someone like grandparents, neighbors, or your own family. Discussing where your family is going for the Father’s Day lunch (several weeks in advance). Reading or watching movies about birthday parties before a birthday party, discussing why and how the characters celebrate in the stories. The sky’s the limit, and parents know best what their children will respond to. Your family shouldn’t feel pinned in by other people’s traditions. People will probably try to push you into participating in holiday events and activities, but remember that your family is your responsibility, not theirs…and they shouldn’t make you feel guilty because of it. The goal behind all of this is to find ways to teach your child that change can be good. The key is making it clear that change is coming. He/she might resist at first, but if the child expects some changes to the schedule that will yield good outcomes, it will be less painful when other changes take place, too. Your child might hate shopping for Christmas gifts, but if he/she knows you will be getting hot chocolate for the both of you to share after you visit three stores, your child will probably put up a weaker fight during the wait. All children on the autism spectrum are different. Your children know exactly what they like and dislike, but you know what they truly need. The best place is a happy medium for all, teaching you to be creative, and teaching your child with autism to be more flexible. Over the years, of course, life will change, and your family traditions will, too. Sometimes, honoring traditions won’t go exactly to plan. The key is to keep your child in the loop and talk with him/her about what is happening as much as possible. The child might not verbalize it, but your willingness to be flexible with his/her needs is one of the greatest gifts you can ever give. *Note: The name and grade of the child in the opening example has been changed to protect his/her privacy. The author simply used an instance similar to one that she experienced to exemplify the reality of many children. “Rigidity.” Merriam-Webster.com. Merriam-Webster, N.d. Web 16 July. 2016. Goehner, Amy Lennard. 2009. Travel Tips. April 26. Accessed December 2013, 2013. http://content.time.com/time/specials/packages/article/0,28804,1893554_1893556,00.html. As an Air Force wife, mommy of a toddler, and Las Vegas native, Brittany Fichter’s life is far from boring. She runs her writing business from home, where she writes about life with neurological disorders by day and fairy tale retellings by night. You can learn more by going to BrittanyFichterWrites.com or contacting her at BrittanyFichterWrites@gmail.com. As an Air Force wife, mommy of a toddler, and Las Vegas native, Brittany Fichter's life is far from boring. She runs her writing business from home, where she writes about life with neurological disorders by day and fairy tale retellings by night. You can learn more by going to BrittanyFichterWrites.com or contacting her at BrittanyFichterWrites@gmail.com.